Happy Friday before Christmas!! 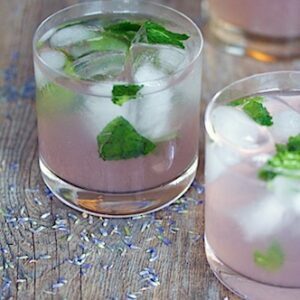 I had a cocktail all ready to go for you because I really haven’t celebrated Cocktail Friday with y’all in quite a while (hangs head in shame). 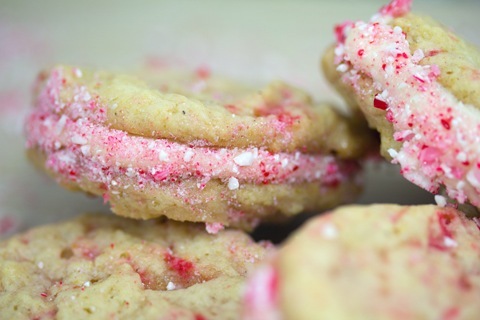 But then I got all panicked and realized this was really my last day to share a holiday recipe on WANM. 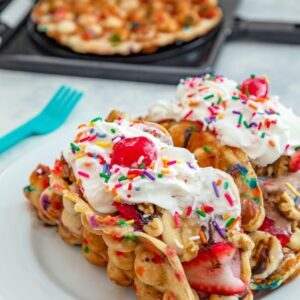 And if you’re looking for some last-minute ideas on what to make for a little treat, you are probably looking now. So, my cocktail post can wait until next week. 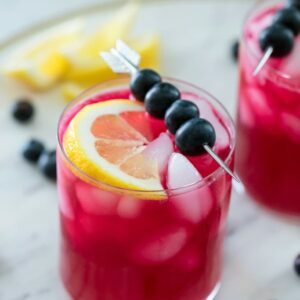 Cocktails are always in style, right? Unfortunately, egg nog and candy canes are not always in style. And it’s a dang shame. Though the holiday season has gone by way too quickly, I have to say that I’m quite pleased by the number of egg nog and peppermint recipes I packed in. Clearly, they were my flavors of the season and I’m going to miss them dearly. I’m also going to miss Celestial Seasoning’s Sugar Cookie Sleigh Ride Tea and all of the Polar Ice winter/holiday flavors, though I will probably not stop drinking them any time soon. Now we’re moving on to all of those fabulous January and February flavors like um… yeah. Really, though, I have a feeling sweet potatoes and blood oranges will be making many appearances in my life in the next couple months. 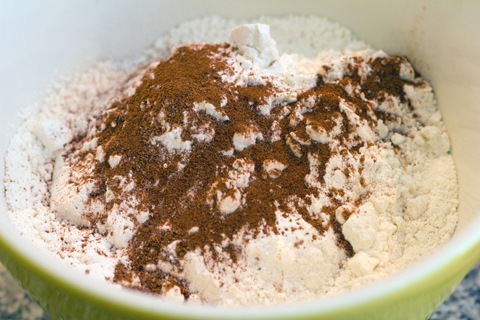 Whisk together flour, baking powder, nutmeg, and cinnamon in a medium bowl. 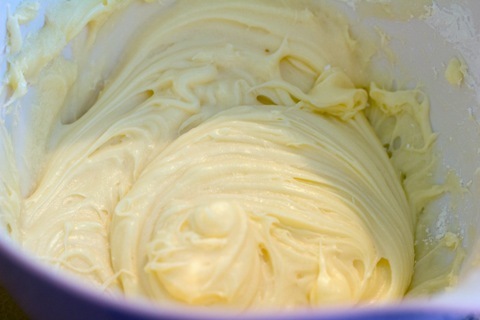 In a stand mixer (or in a large bowl with hand mixer), cream together butter and sugar until light and fluffy. 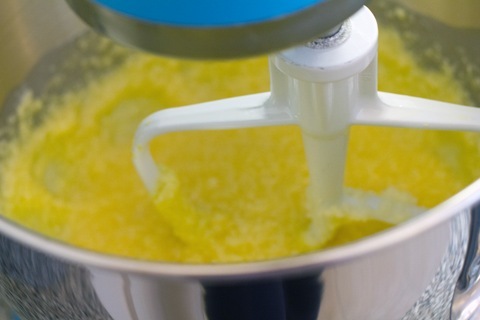 Then add egg nog and egg yolks and beat until blended. 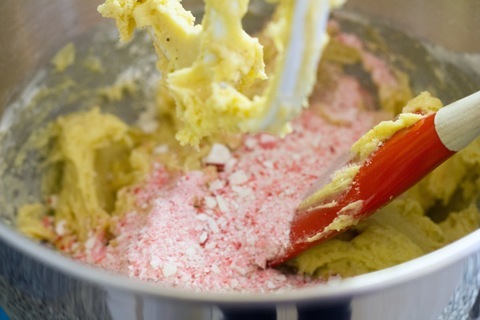 Now, slowly add the flour into the mixture, with the mixer set to low, until just blended. Be careful not to over-mix. 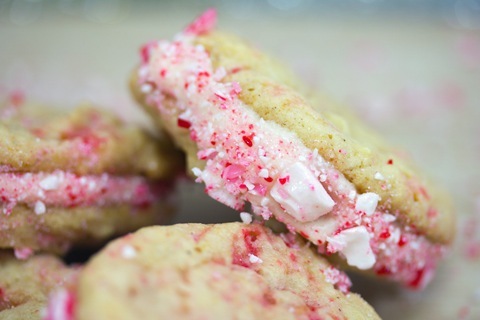 With a spatula, stir in half of the crushed candy canes, reserving half for after the cookies are baked. 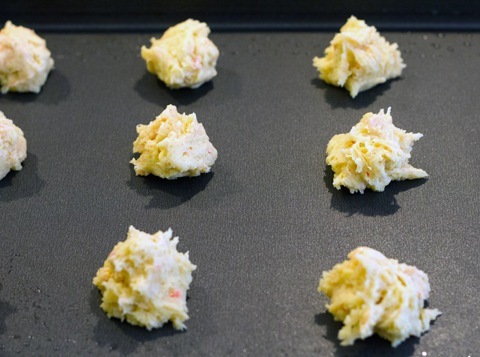 Place teaspoon size scoops of dough onto an ungreased cookie sheet, about 2 inches apart. Bake at 300 degrees for about 18-22 minutes (depending on how you like your cookies… I prefer mine to be a little soft over crispy!). Let cookies cool a bit on the tray and then move to a wire rack to cool completely. 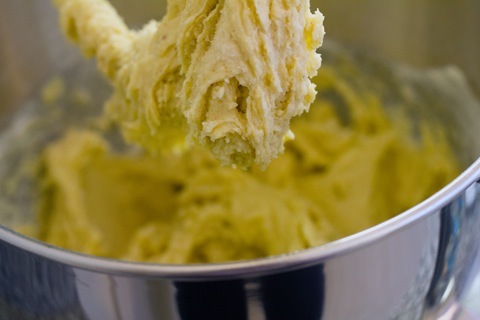 While cookies are cooling, whip up the frosting. Simply cream together the butter and powdered sugar. Then mix in the egg nog until it’s the consistency you like. 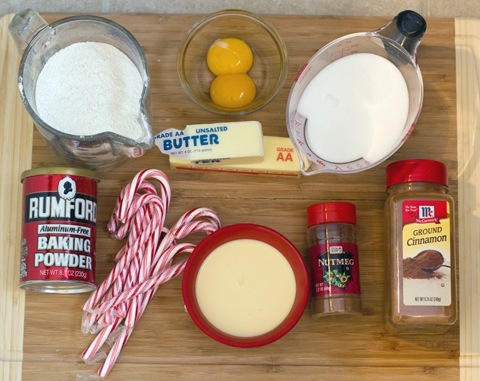 If you need to add more sugar or egg nog, you obviously can! 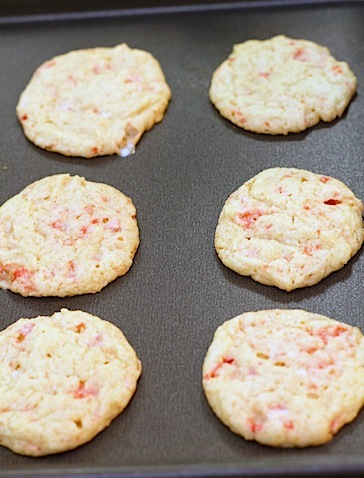 Now spread some frosting on a cookie and place another cookie on top. Press down so the frosting comes out the edges. 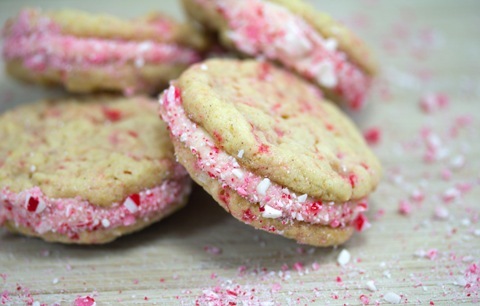 Then roll cookie in crushed peppermint. And your holidays may resume. Seriously though, I’m so excited that after all my egg nog recipes and all my peppermint recipes for the year, I finally combined them together. Now somebody just needs to come up with an egg nog peppermint latte. Like really, though, can we make that happen? Because these cookies would go perfectly with one. The thing is, there are cookies. 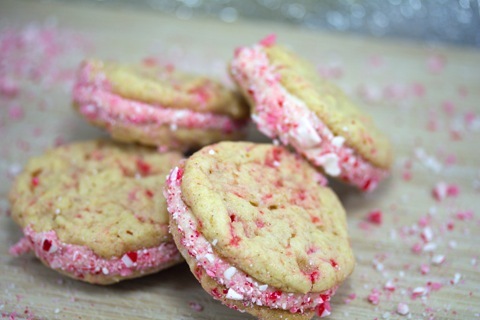 And then there are sandwich cookies. And I will almost always choose a sandwich cookie. Because… Frosting. I was an especially big fan of the egg nog flavored frosting because the flavor came out pretty perfectly. And the crushed peppermint was just the icing on the cake. Er, no. I guess I mean the icing on top of the icing on the cookie. 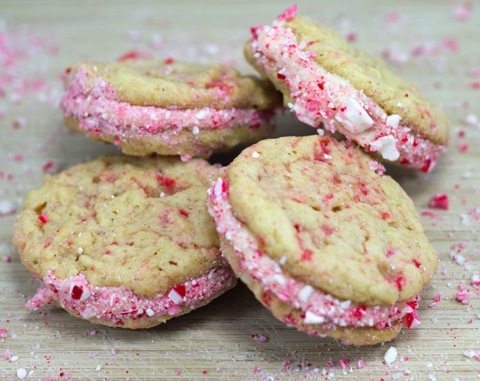 You should definitely make these to bring these to all your holiday parties this weekend 🙂 Or just make them for yourself and eat a batch at home. It’s the holidays; you’re allowed. You could save one for Santa if you’re feeling nice. To all our lovely readers, I hope you all have the most wonderful Christmas (if you celebrate!) and have the chance to spend time with your loved ones. I’ll be in Virginia with my in-laws and am so psyched to see them! I’m also going to miss my parents and sister and bro-in-law SO SO much. It’s my first Christmas away from my parents and it’s definitely a little bit tough. But we’re going to celebrate with them when we get back to Boston and will just pretend it’s Christmas all over again. And I count myself pretty lucky that I’m 30 and have spent every single Christmas of my life with my parents 🙂 And we will have many, many more! Do you have any holiday baking plans? 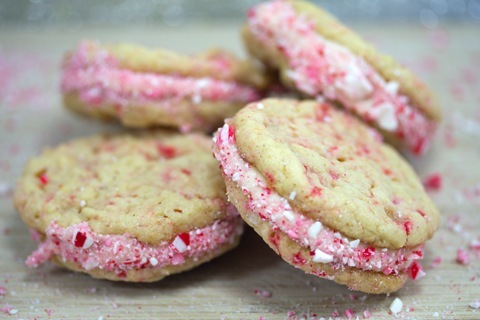 6 Responses to "Egg Nog Peppermint Sandwich Cookies"
i have been baking for what feels like weeks 😛 i still have a cookie recipe i haven’t posted about, but who knows when that’ll go up… i know no one wants to see it in the new year! We’re heading to New Orleans for Christmas with my fiance’s family, but we’re having a second Christmas with my family next weekend – which means I will be baking and cooking a week later than I normally would be! These sound amazing. I haven’t baked with eggnog but would love to. Great idea! Yum! I so love eggnog and peppermint but never thought to try them together…great idea! So festive and fun 🙂 Have a great holiday! They are so darn pretty! They scream christmas. Hope you have an awesome holiday! These are so impressive! 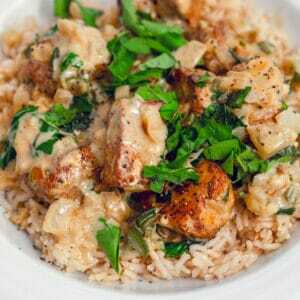 Great holiday recipe.